A delectable Butterscotch Custard Pie. 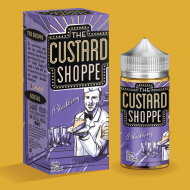 The Custard Shoppe is the newest line from Jam Monster! A delectable Raspberry Custard Pie. The Custard Shoppe is the newest line from Jam Monster! A delectable Blackberry Custard Pie. The Custard Shoppe is the newest line from Jam Monster! Strawberry – Handpicked Strawberries, blended with velvety Vanilla Custard, gloriously sweet. Lemon – A creamy & tart treasure. Lemon Curd combined with luscious Custard. 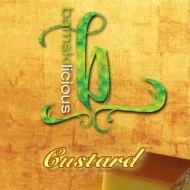 Bamskilicious’ latest flavour “Custard” was inspired by Custom Vapes due to its popularity in the UK. This one’s extra special with Bamski’s signature “Magic” touch. A desert inspired vape with just the right tart and sweetness, just like mom’s leche flan.